A report released by the Defense Department warns that climate change threatens to intensify global instability, disease and poverty, while undermining U.S. military readiness. But judging from the events of the past year, Congress will not only disregard the report's findings, but actively block its recommendations. In our defense strategy, we refer to climate change as a "threat multiplier" because it has the potential to exacerbate many of the challenges we are dealing with today – from infectious disease to terrorism. We are already beginning to see some of these impacts. While scientists are converging toward consensus on future climate projections, uncertainty remains. But this cannot be an excuse for delaying action. Every day, our military deals with global uncertainty. Our planners know that, as military strategist Carl von Clausewitz wrote, "all action must, to a certain extent, be planned in a mere twilight." That last statement is a theme that military strategists have been stressing time and again: the costs of inaction will very likely be more than the costs of preparation. 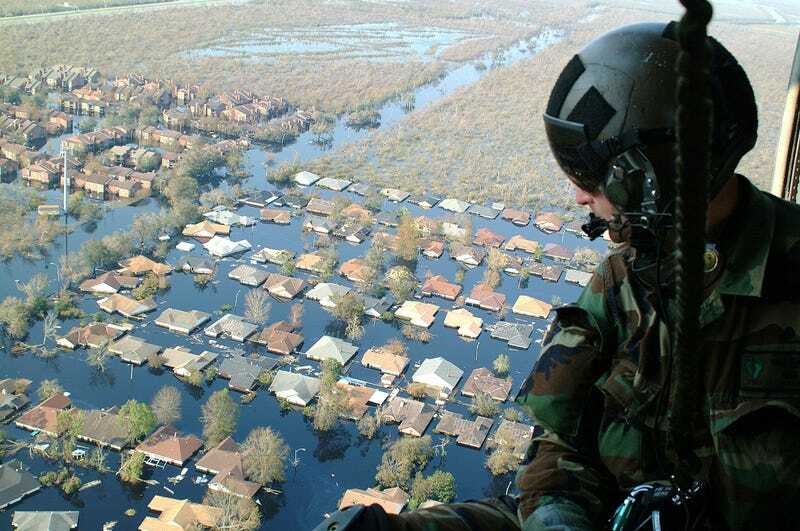 U.S. military planning can't remain in an indefinite holding pattern while members of Congress are still trying to grasp the difference between climate and weather. "Speaking as a soldier, we never have 100 percent certainty," General Gordon Sullivan (U.S. Army, Retired) stated earlier this year. "If you wait until you have 100 percent certainty, something bad is going to happen on the battlefield." "Managing risk is seldom about dealing with absolute certainties but, rather, involves careful analysis of the probability of an event and the resultant consequences of that event occurring. Even very low probability events with devastating consequences must be considered and mitigation/adaptation schemes developed and employed. We operate our nuclear submarine fleet in this manner. Some may argue that this continuing process results in overdesign and over cautiousness. Maybe so, but our U.S. submarine safety record testifies to the wisdom of this approach. That's where we should be with climate change knowns and unknowns." Although the Pentagon report has a dramatic opener, it makes for boring reading. It's not filled with gripping potential scenarios or even the dramatic charts that are de rigueur for climate change studies. For such details, your best bet is to check out other studies published earlier this year, including (1) an important though largely overlooked GAO report, DOD Can Improve Infrastructure Planning and Processes to Better Account for Potential Impacts (2) the Defense Department's 2014 Quadrennial Defense Review (QDR) and (3) a study written by an advisory group of retired, high-ranking military officers, titled National Security and the Accelerating Risks of Climate Change. That said, the report is highly significant in that it is a publicly stated commitment to implement long-term plans. As such, the criticism has already begun. "ISIS is still gaining ground and causing havoc in Syria and Iraq, with foreign fighters from over 80 countries coming and going into the fight and then returning to their home country," Senator James Inhofe (R-OK), a prominent climate change denier and the ranking Republican on the Senate Armed Services Committee, said of the Pentagon report. "It is disappointing, but not surprising, that the president and his administration would focus on climate change when there are other, legitimate threats in the world." It's also disappointing, but not surprising, that Inhofe doesn't acknowledge or realize that climate is a big reason why we currently have this mess in the Middle East. Severe drought and mismanagement of natural resources displaced 1.5 million people in Syria, which contributed to the eruption of that country's civil war. You couldn't ask for a better contemporary case study of how climate disruption can act as a threat multiplier. I predict, however, that Inhofe's response is the talking point that we'll be hearing over and over again from Congressional Republicans and the talking heads at Fox News. It's nicely crafted: accusing the Obama administration of not paying attention to real security threats, while deftly avoiding a direct criticism of the Pentagon. Consider how drastically the Pentagon has been forced to adapt since the end of the Cold War….Now we are proposing a massive shakeup to Pentagon policy by adding yet another core mission— climate change, which has nothing to do with winning battles— to an already crowded task list....is it wise to continue to violently disrupt a culture which is fueled by tradition and a fierce warrior ethos by forcing them to constantly adjust to the popular political trends of the day? Let's free up the Navy from responsibility for protecting our planet from natural climate change so that they can concentrate on addressing real man-made threats to our national independence…a mission they can actually do something about! This approach leads to recommendations that limit the flexibility of the military by, for example, limiting its options regarding the use of energy. While the QDR asserts that such steps will not undermine the military's ability to perform its missions, it is likely they will. This is like telling the fire department to cut down on hydrant use in order to conserve water. The link between extreme weather and global warming is debatable….All of this seems to be a very shaky foundation upon which to reshape America's defense strategy. In its oversight role, Congress should challenge the administration's inclusion of climate change as a defense priority. Ultimately, it falls to Congress to appropriate the funds that the Pentagon will need to implement its roadmap. Translation: Don't even THINK about initiating military programs to prepare for the potential impacts of climate change. Will McKinley's amendment survive in the Senate? Doubtful, I like to think. But it's a portent of things to come if the GOP ends up controlling both houses of Congress. And meanwhile, we still have a budget crunch. A particular concern is that the exorbitant costs of modernizing our nuclear forces are eating away so much of the defense budget, that analysts don't know how Congress will also be able to pay for the conventional weapons on the Pentagon's wish list. How much money, then, will Congress pony up for the Defense Department's roadmap, when many of our representatives don't even believe that climate change poses a threat?